The cinder light of the Moon occurs when it is only illuminated by the Earth. Sometimes white, sometimes red, crescent-shaped, oval or perfectly round, the Moon has been the faithful companion of the Earth for billions of years. Born at the same time as the Earth the Lady of Night aged prematurely but its gaze has kept all its intensity and still dreams many observers who courtez it when it deigns to appear above the horizon. The Moon is not a planet because it does not turn around the Sun; The moon revolves around the Earth. It is therefore the natural satellite of the Earth. But there are also so-called artificial satellites that revolve around the Earth and are used for telecommunications or for studying our planet. The Moon orbits very far from Earth, about 384,000 km away while most artificial satellites revolve around the Earth at about 500 km altitude, some 36,000 km as geostationary satellites. The Moon is so far that it takes 4 days to reach it in rocket. We will talk about it in the page devoted to the exploration of the Moon. The Moon always has the same apparent diameter, even near the horizon where it gives the impression of being much bigger. 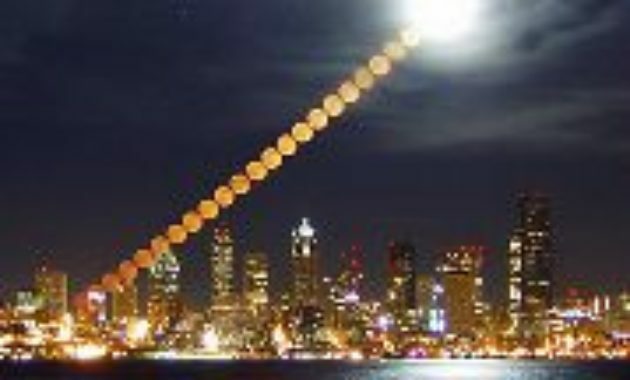 It is in fact an optical illusion as seen in the photograph on the left: near the horizon or very high in the sky the Moon always has the same diameter! Four times smaller and 81 times lighter than Earth, the Moon is 3476 km in diameter. It is one of the biggest satellites in the solar system, as big as the Europe satellite that revolves around Jupiter and which you can observe as a shining star in a small telescope. It represents the 3/4 of the planet Mercury which is the planet closest to the Sun. There is no atmosphere and therefore no air on the moon. This is why cosmonauts have to wear a scuba to breathe when exploring the lunar ground. 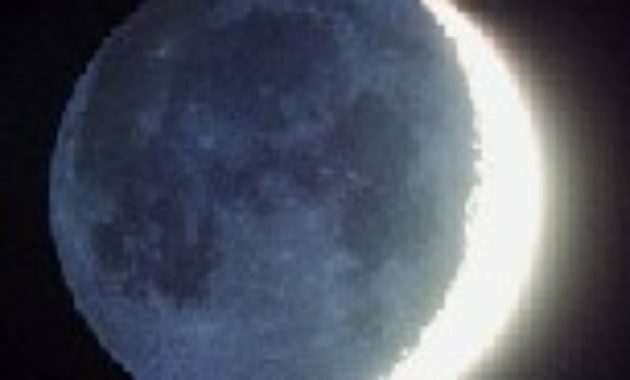 The Moon lost its atmosphere soon after its formation because its low gravity could not retain it and the gases are gradually escaped in the space. 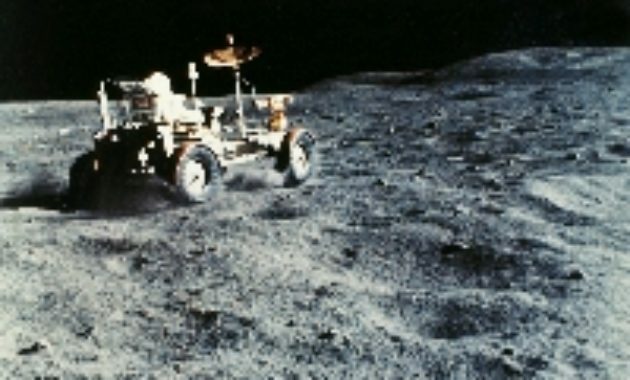 The Jeep of Apollo 15, April 1972. On the moon gravity is worth sixth of that of the Earth. A person weighing 60 kg on Earth weighs only 10 kg on the moon! Without atmosphere the extremes of temperature are the same as in space. In the space of 8 hours, if you put an object in the shade, its temperature will drop to -173 ° C and if you leave it in full sun it can reach about 130 ° C! But since there is no air, the heat does not spread easily and the material that remains in the Sun (camera, flag, etc.) does not risk being damaged by the heat. The lunar basement is so cold that it is frozen over 2 meters deep by -17 ° C. The surface resembles talc or very fine powder and is made up of very compact meteorite debris that has accumulated over 10 meters in thickness, in which, due to the vacuum and cold it is difficult to drive a pile Without the help of a hammer. On the other hand to ride there in jeep all-terrain as did several crews of missions Apollo, it’s great! Since there is no wind or rain on the Moon, all the craters and footprints left behind by the astronauts will still be visible in millions of years. On the other hand, this phenomenon is impossible on Earth because in a few hours or a few years all traces disappear due to erosion. But there is no liquid water on the surface or grass on the Moon, only pebbles and dust. So there is no life on the Moon. The landscape resembles a silent desert full of craters and gray mountains. It must not be very funny to live up there. View of the Earth The surface of the Moon has large dark areas known as “seas” and clear areas known as mountainous. Several hundred years ago, in the time of Galilee, it was believed that the Moon was like the Earth and that the dark areas represented large bodies of water like our oceans. But today we know that these great dark spots are not at all seas but old giant craters that were filled with lava by the impacts of meteorites and some volcanoes active billions of years ago. Today the Moon is almost dead and all the volcanoes are extinct. Only its core emits a little heat.